Nope, the ancient Greeks and Egyptians didn’t think beauty was in the eye of the beholder. They relied on a mathematical proportion dubbed ‘phi’ by the American mathematician Mark Barr. This proportion, roughly 1:1.61, is seen everywhere in nature — in the spirals of seashells, pinecones, insects, and even in our own faces and bodies! Artists and designers have been using this proportion for thousands of years. The proportions of the Great Pyramids of Giza, Parthenon, and Mona Lisa are what make these works such marvels. This ratio is so harmonious, it’s been called the “Golden Mean”. So, how can you use the Golden Mean in your own work? First, create a rectangle. Then fit a square in the rectangle that exactly matches the size of the rectangle’s short end. This will give you another rectangle. Create a new square within this new rectangle, again matching the square’s side to the length of the rectangle’s short end. Continue embedding squares in each successive rectangle, as many times as you want. You will then have created a perfect compositional grid. Now, all you have to do is position the major elements of your design to fit the grid. And voila — you’ve just made a masterpiece! 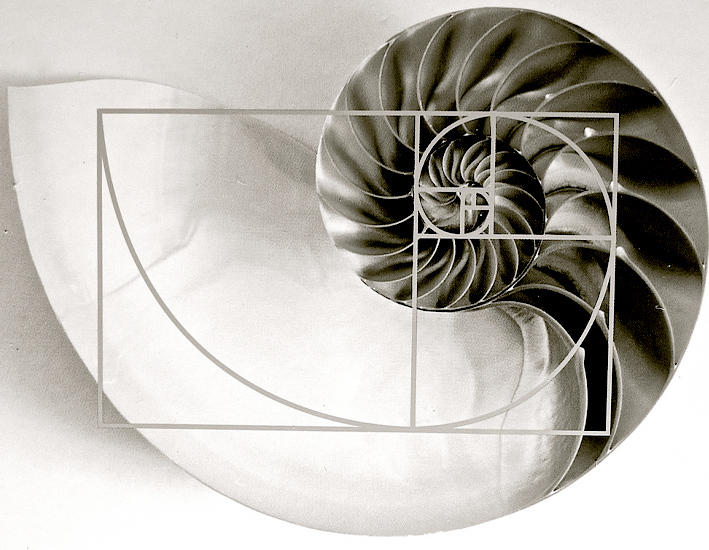 How have you used the Golden Mean in your work? Tell us in the comments below!